Rounds of cucumber on dainty slices of white bread generously buttered with goat's butter are perfect for an afternoon in the garden. Pile them high next to a pitcher of ginger beer bobbing with juicy limes. Place the ginger in a food processor, pulse until coarsely chopped and tip into a medium-sized saucepan. Add the lemon zest and juice to the pan with the sugar and 500ml cold water and heat until the sugar is dissolved. Bring to the boil and simmer for 20 minutes. Remove from the heat and cool. Cover and chill for 24–48 hours. To make the sandwiches, mix the goat's butter with the watercress or borage and season. Spread on the slices of bread; top half of them with the cucumber and remaining slices of bread, then cut into 3 fingers. Strain the ginger cordial and dilute with the soda water. 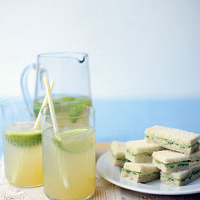 Serve in a jug with plenty of ice and the lime quarters, along with a plate of sandwiches, in a shady spot outdoors.